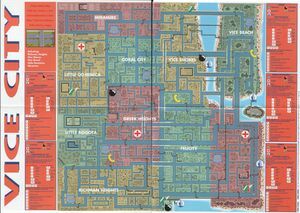 Map of Vice City neighborhoods. This page is about the city in GTA 1. For the city in GTA Vice City or GTA Vice City Stories, see Vice City in GTA III Era. Vice City is a city in Grand Theft Auto 1, mimicking the real-life American city of Miami, Florida. The city is unlocked upon completion of the second string of San Andreas missions. "A former Spanish slaving colony, Vice City, or City of the Fallen Angel, holy mother of all and yet of nothing (to give it its nish name), is a city that revolves around just one thing; money. From the retired doctors and lawyers of Vice Beach to the cocaine dealers of Little Bogotá, everyone is desperate to show off just how much they can spend in this subtropical paradise. The downtown area of Felicity is so-called to reflect the fortune early settlers felt at arriving at such a beautiful place. Modern-day visitors might feel slightly-less fortunate if they take a wrong turning and stumble into the nastier corners of Little Dominica. More than anywhere else in America, Vice City is the archetypal 'melting pot', with large Caribbean, Colombian and European communities, always feuding with another, often with very violent consequences. The once-peaceful Rastafarian community has become a haven for Yardie criminals who found the going a little too hot in Kingston, and their clashes with the Colombian drug lords have given western Vice City an unenviable reputation. Initial attempts to control the troubles by the Police Department failed following revelations of wide spread corruption and drug trafficking within the force, and the problems have. Vice City now boasts the highest murder rates, the highest amounts of drug-related crime and the least respected police department of anywhere in the USA. Still, it's not all bad. As Mrs. Mary Clam, President of the Tourist Board, told us 'Vice City has a deservedly bad reputation as a very dangerous city, but as long as visitors stay out of the downtown area, only go out in daylight hours and never leave their car, they stand a very good chance of survival. Besides, we serve the best tacos in the south-east, and there's no denying the Vice City orange juice is the finest in the USA. As we say in these parts, our welcome may not always be friendly, but it's always warm." Compared to its later counterpart, the GTA 1 rendition of Vice City is more geographically accurate to Miami. The city is designed with a large mainland to the southwest, while a small peninsula and island are located on the northeast. The city is characterized as a tropical city, featuring palm trees, and beaches and hotels along much of its coastlines, while the heart of the mainland is designed as the core of the city, and the western end of the city is dotted with low-density buildings. Like Liberty City, Vice City also contains a looped train line that runs through the mainland and peninsula. While geographically accurate, it is not as accurate in culture. Western Miami, Fort Lauderdale, and surrounding areas are depicted as "Vice Beach". North Miami Beach and the Central Business District have been tagged as "Felicity". Eastern Vice City is made up of Miramire, Coral City, Greek Heights, Little Dominica, Little Bogota and Richman Heights, each representing the counties Broward and Dade. Alternate rendering of Vice City. A screenshot of Vice Beach. This page was last modified on 22 April 2012, at 19:31.